This is a good clean Yankee ratchet / spiral screwdriver, clearly marked "YANKEE NO. 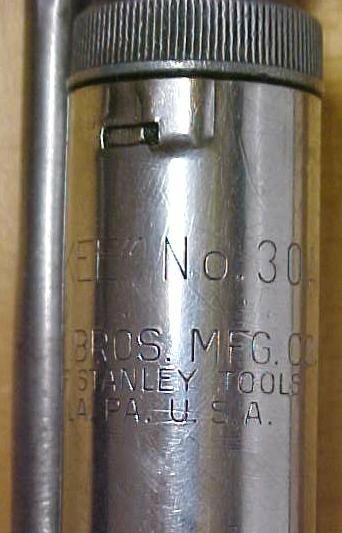 30A NORTH BROS. MFG. CO. DIVISION OF STANLEY TOOLS PHILA. PA U.S.A.". Comes with one good slot tip. We generally have other tips and hex and other adapters available for sale seperately for this Yankee brand model and other at this website. This screwdriver has about 90% of the nickel plating is intact, and about 90% stain and varnish intact on the handle, a few small dings in the wood finish, along with some minor rubs and minor scratches on the metal. This type spiral drill is not spring loaded (no rapid return) in the spiral area drive area, works perfectly, as from the factory. <br> This one is 16" long overall with no bit in place, fully extended, and uses the 7/32" (.28") diameter shank tips. Works Great! <br> We also sell Yankee hex bit adapters for the larger size of Yankee screwdriver separately at this website. Items Similar To "Stanley Yankee No. 30A Screwdriver"